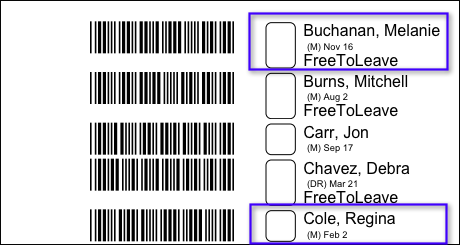 You can print roll sheets with the name of a specific Small Group displaying under the name of each person in that small group. Wednesday nights are HUGE for our children! Tons of them register online each semester for our music or discipleship classes. The parents of our older elementary children are given an option of either allowing their children to leave the class on their own or requiring them to be picked up by a parent. We needed a way to capture that information and to display it readily to the teacher. The first part of the solution is to add a Yes/No question on the on online registration asking if the child is free to leave class alone instead of having the parent pick them up. This creates small groups based on the answer. If they answer Yes, the small group is named FreeToLeave . You can also create small groups manually and add children to those groups if you have gathered that information in another format. The next step is to print the roll sheets so that this small group FreeToLeave will display on the roll sheet. This lets the teacher see at a glance which children can leave on their own. Create roll sheets using your normal method - either from Organization Search or from an individual Organization. When you are viewing the Create Roll Sheet dialog box, enter the name of the Small Group in the Highlight Group text box. Click OK and then print the roll sheets. Anyone in the Small Group indicated will have that Small Group name displayed under their name. Here is what a section of the rollsheet will look like. Notice that Melanie Buchanan can leave by herself, but Regina Cole cannot. 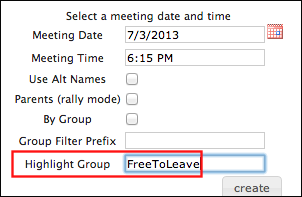 You must have a Small Group with the name you want to display on the rollsheet - such as, FreeToLeave (whether you create it manually or during the online registration). Also, you can name the Small Group anything you want, but it cannot have any spaces in the name. © 2019 TouchPoint Software, LLC. All rights reserved.